It is an agro-biotechnology consortium that includes the provinces of Chaco, Tucumán, La Rioja and Misiones. In the city of Posadas, at the Biofábrica of the Parque Technológico Misiones (PTMI) [Technological Park of Misiones], the president of the National Scientific and Technical Research Council (CONICET), Dr. Roberto Salvarezza, presented the “Q-ARAX”, an agro-biotechnology public company in which the Council is a founding partner. The company was created in order to administer, transfer, develop and commercialize technological solutions that boost regional economy and agricultural and forest production of Argentina and the Southern Cone. 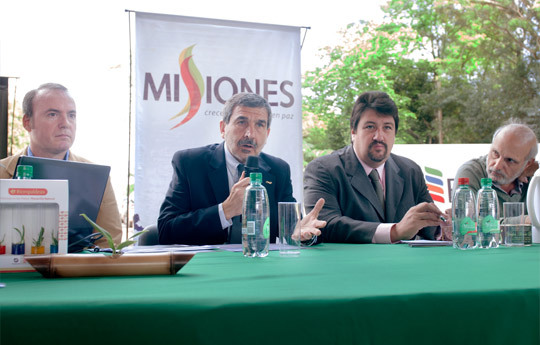 The conference was attended by the governor of the province, Maurice Closs; the minister of Culture, Education, Science and Technology of the province of Misiones and the president of the Parque Tecnológico Misiones, Eng. Luis Jacobo; and the undersecretary of Science, Technology, and Productive Innovation, Carlos Gailán. Q-ARAZ is one example of EBT because it has five partners distributed geographically in a strategic way encompassing the NOA (Argentine Northwest), NEA (Argentine Northeast), Cuyo and the Centre of the country. The company is composed of the CONICET, Biofábrica Misiones S.A., Agrogenética Riojana SAPEM, Estación Experimental Agroindustrial Obispo Colombres (EEAOC) de Tucumán and the Escuela de Educación Agropecuaria N°13 “Ingeniero Agrónomo José Alberto Ruchesi” in Chaco. “Although there have been important developments in biotechnology, we still find it hard to transfer it from the laboratories at the CONICET to the society. Q-ARAX aims to be a company for all the country, a central characteristic of this project, so for this reason we have the provinces of Chaco, La Rioja, Misiones and Tucumán working together to have a national company devoted to plant technology”, Salvareza said. Q-ARAX is going to have the experience in technology transference and the scientific knowledge of the 16 institutes of the CONICET devoted to plant biotechnology (genetics, genomics, bio-supplies, micropropagation, etc. ).